In addition to the barometer graph (see Using Barometer profile), Suunto Ambit2 has two weather indicators: weather trend and storm alarm. The weather trend indicator is displayed as a view in Time mode, providing you a quick way to check weather changes. A significant drop in barometric pressure typically means a storm is coming and you should take cover. 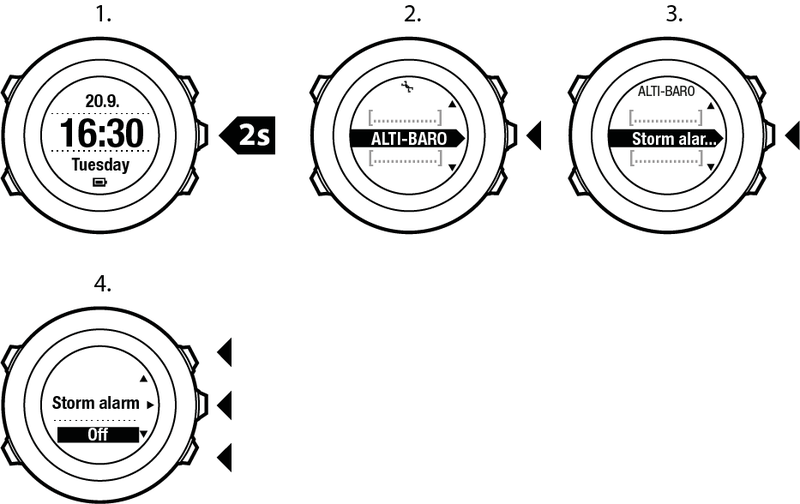 When the storm alarm is active, Suunto Ambit2sounds an alarm and flashes a storm symbol when the pressure drops 4 hPa / 0.12 inHg or more during a 3-hour period. The storm alarm does not work if you have altimeter profile activated. See Setting profiles. Scroll to Alti-baro with Light Lock and enter with Next. Press Next to select Storm alarm. Set the storm alarm On or Off with with Start Stop or Light Lock and accept with Next. When a storm alarm occurs, pressing any button ends the alarm. If no button is pressed, the alarm repeats once after five minutes. The storm symbol remains on the display until the weather conditions stabilize (pressure drop slows down). A special lap (called 'storm alarm') is generated when a storm alarm occurs while recording an exercise. You can also activate or deactivate the storm alarm through the options menu in a sport mode.